4997. Elijah riding his bike with pedals! 4998. Jude picking up his feet and balancing! 5020. six quarts of *unsprayed* strawberries!! for only $12! 5034. seeking me "when a stranger, wandering from the fold of God"
Kimm Crandall is wild about grace, obsessed with pointing desperate moms to Jesus. Again and again I've printed off posts or copied quotes from her blog to preach to myself. So when I found out she had a book coming out this spring, I knew I would want to read it. 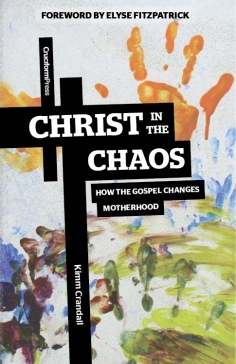 Christ in the Chaos isn't your usual guilt-inducing book about motherhood. Instead, it's oxygen for the soul--and it's not just for mothers. Kimm begins by helping readers root our identity not in motherhood, but in our place as His beloved daughters. A mom of four, Kimm doesn't pretend to have it all together; she knows she's desperately inadequate and isn't afraid to shout out that truth. Like the Apostle Paul, she gladly boasts in her weakness so that Christ's power can rest on her. And as she hides herself in Him, she brings something heavy to her readers: not the burdens of guilt and shame, of "should" and try harder and do better, but the weight of glory--the reassurance of love and holy welcome and finished work to rest in. As Kimm explains, whether we are consumed with guilt and despair over how we have failed our children, or whether we are patting ourselves on the back for being Awesome Moms, our love for our kids is tainted with selfishness and pride. Chaos reigns when we are worshipping self, focused on our own abilities and successes. Our chaotic, sin-tainted hearts need the good news of the gospel--that we are beloved; that our identity, our righteousness, is in Christ. All this talk about grace can make some people twitchy: Are you saying obedience doesn’t matter? But Kimm's heart is clearly to see you walking in obedient trust. She simply believes that grace *must* be the foundation, the motivation, the air we breathe whether we succeed or fail. Though I was encouraged by what I read, I found myself squirming a bit uncomfortably a couple of times. I’m not honestly sure if that’s because Kimm’s words were actually off-base or misguided in their emphasis, or simply because grace is so counterintuitive and I have lived so much of my life on the basis of my performance. It may be some of both. I do struggle with a performance orientation and need to humbly lean on grace…yet I also believe we can’t ignore the *transforming* nature of grace. The grace God gives us is grace that enables us to change, not only grace that forgives and covers our failures. Right after reading this book, I read a challenging article by Dr. David Powlison in the Journal of Biblical Counseling. In “How Does Sanctification Work? Part 1,” Powlison argues against overemphasizing the doctrine of justification to the neglect of other beautiful, life-changing truths in Scripture. He contends that for certain types of people with certain struggles (like Kimm, or me), the constant reminder of justification might be exactly what is needed—but for others, other messages (built on the foundation of justification, but not exclusively about it) may be more timely and helpful. I then read a friendly debate between Tullian Tchividjian (who shares Kimm’s perspective) and Kevin DeYoung on the role of effort in sanctification. I’m still processing all this, and eagerly awaiting part two of Powlison’s article. Powlison knows how to apply the gospel and keep it central as well as or better than anyone I’ve learned from, so I can’t dismiss his concerns. In the end, I do wholeheartedly recommend Christ in the Chaos. Kimm’s courageous honesty about her weakness and inadequacy does exactly what she hopes it will do: points readers to what a great Savior she has and the beauty of His mercy and grace. 4970. my peonies in full bloom! 4975. Elijah, sponaneously "I love you, Mom." Happy Birthday to Me: S'more Cake! I took all kinds of pictures of my birthday cake, wanting to blog about it, and then never got around to it for almost two months. Better late than never, right? S'mores are probably one of my all-time favorite desserts. So when I saw a recipe for a s'more layer cake in The Smitten Kitchen Cookbook, I knew I had to try it. Elijah helped me make the cake; I made (and repeatedly sampled) the milk chocolate filling; and then Steve tackled the frosting (the seven-minute kind I hate making) and assembled the cake. Is that fun or what? A toasted marshmallow effect. My verdict upon tasting it: if s'mores were a cake, they would taste like this. But s'mores are meant to be eaten as s'mores, not as cake. The cake had a graham flavor, but I prefer lots of other flavors of cake. The milk chocolate filling was delicious, but never thickened enough (even overnight in the fridge) to work well as filling. It squeezed out the sides as soon as you stacked the layers, so we ended up just having to drizzle it over our cake slices. And the frosting was indeed marshmallow-y, but not my favorite frosting by a long shot. I've made seven-minute frosting once before where it gets this kind of crystallized crust the next day. This one didn't do that--it kind of disintegrated/dissolved (as you can see on the photo below, which I didn't remember to take until a couple of days later). I much prefer a substantial frosting. 4953. cinnamon sweet potato fritters--Freaking. Amazing. 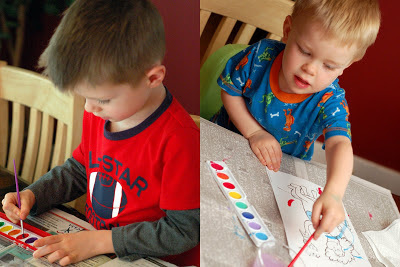 As you've guessed from my recent posting, my Bible reading plan has had me in Leviticus recently (actually a few weeks ago, but I'm just blogging about it). I have to admit it was a struggle. God met me in the first couple of chapters and opened my eyes to see the gospel, but after that it was mostly plodding. One morning I opened my Bible purely out of duty, not hunger. To be honest my thoughts were, "I really should read now so I don't fall behind on my reading plan, but ugh, Leviticus. I'm tired of slogging through all these regulations about skin diseases and offering specifications." I arrogantly thought, "what is there to gain from reading all this? It's just the same point over and over: God is holy and we are not; costly sacrifices must be made. OK, OK, got it." Isn't it just like God in His mercy and grace to meet me there in spite of my cynical attitude and my lack of expectation?? He once again opened my eyes as I was reading chapters 21-22. I kept noticing the phrase "I am the LORD who sanctifies." Don't do this, for I am the LORD who sanctifies you. The priest must not do that, for I am the LORD who sanctifies him. They shall not do such and such, for I am the LORD who sanctifies them. I realized that in the midst of this litany of rules about holiness and purity, it is so easy for me to fall into the mindset that you make yourself clean. You follow the guidelines, you obey the laws, you perform the rituals, and that's how you make yourself acceptable to God. But He inserts over and over--it is *I* who sanctify You. Your rituals and your obedience are not making you holy; I make you holy. This is so integral to who God is and what He does that it's actually a name for Him: "Jehovah Mekoddishkem" is parallel to names like "Jehovah Jireh" (the LORD who provides), "Jehovah Rapha" (the LORD who heals), "El Roi" (the God who sees)...He is "The LORD who sanctifies." He is absolutely committed to making us holy, so much so that it is part of His name. Gives a whole new meaning to the phrase in Scripture, "for Your name's sake!" It's not that we make ourselves holy and acceptable, not that we perform the sacrifices and avoid the taboos and then God declares us holy. No, exactly the opposite: God makes you holy, now act like it! He is the LORD who sanctifies you; because you are sanctified, start behaving in a way that reflects that reality. Still a shadowy, dim reality here in Leviticus under the Old Covenant...but now, in Christ, we *know* we have been declared righteous. Jesus' perfect record has been imputed to us; we are now holy! So--become what you are. Be holy in practice as you already are in standing. So amazed that God condescends to meet me and speak to me even when I have such a crappy attitude about His Word. Truly He is the LORD who sanctifies me--not because of anything good in me, but because of His grace. He doesn't declare me holy after I fulfill His requirements; He declares me holy in spite of myself, and then sends His Spirit to dwell in me and make it so.